The idea of a helpful home-based humanoid robot isn't new, but in the last year or so we've seen a rush of these types of AI-powered helpers appear on the scene, with more on the way: the hardware, software and connectivity required is almost ready for the masses. From big-name companies to small-scale Kickstarters, there's now more choice than ever when choosing a friendly android to potter about the house - we thought it was a good time to introduce some of the robots available now and arriving in the near future. Originally the subject of a wildly successful Indiegogo campaign and still in development ahead of a public launch, Jibo describes itself as "the world's first social robot". Jibo can, for example, take photos, read out messages from the web, alert you to upcoming events, read stories to your kids, make video calls and interact with other devices in the home. Jibo's makers are hoping the robot will plug into all kinds of third-party apps and devices, so it will eventually be able to do everything from turn on the house lights to order you some takeaway. What it can't do is move around on its own - so you might have to buy one for each room - though it is able to track faces and rotate in one set position. Recently unveiled by Asus and expected to launch in the near future, the Zenbo is like the Jibo on wheels. From teaching children to assisting the elderly, it has many a string to its bow, and (as with the makers of Jibo) Asus is hoping to enlist the help of a substantial number of third-party developers to extend the robot's list of capabilities even further. The Zenbo can see, speak and hear, and apparently adapts to your preferences to get smarter over time. It's connected directly to the cloud so it can interface with other services, and even doubles up as a music speaker if you want to blast out some tunes in the room you're currently in. Asus says the Zenbo will cost US$599 (roughly £410). Sony's Xperia Agent is an intelligent home robot concept that the Japanese company showed off earlier this year at Mobile World Congress - as yet there's no word on when Sony might actually make the Xperia Agent or how much one will cost, but based on the brief demo video we've seen, it could well be a smart home assistant worth waiting for. Like the other robots we've already mentioned, the Xperia Agent will be smart enough to welcome you home and then turn the lights on (for example) - it can pull information from the web, help you communicate with other people, and control your smart home. It's going to come with an integrated camera and projector as well, according to Sony. Another home robot with an "o" at the end of its name, Aido is bigger and bulkier than the droids we've looked at so far. Like Jibo, it's been born out of an Indiegogo campaign, and you can currently get pre-orders in for $599 (about £410) with shipping expected in October. Its creators are currently encouraging developers to build new apps for the robot. From the dreamy demo video it looks like Aido will be able to project your Facebook News Feed on the wall, teach your daughter piano, keep an eye on the cooking, integrate with other smart home devices and patrol the hallways when you've all gone to bed. Aido is fully mobile though it looks like the bot might have a problem when it comes to stairs. Pepper hails from Japan (where they're very keen indeed on their robots) and is the most human-like of the bots we've listed here - it's designed to act as a genuine friend and companion rather than just completing tasks for you. 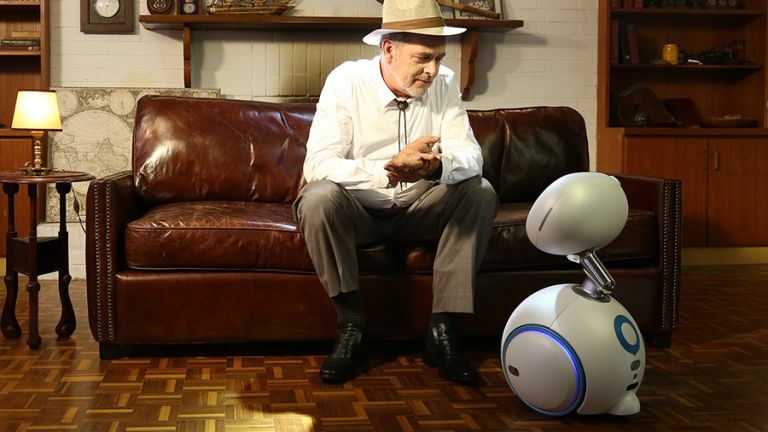 Having sold reasonably well in Japan the robot is coming to the US this summer and costs around $1,800 (or £1,230). Pepper's key party trick is being able to recognise and react to human emotions, so it might offer to cheer you up if you're looking miserable. It can hold a conversation, answer questions, read out the weather and move around on its own, and it also has arms, hands and fingers, which means it's capable of interacting with people and objects directly. The Furo-i is one of several bots from the same family and it mixes together all of the features we've seen above: video calling, educational apps, smart responses to questions, and so on. There's a Samsung tablet affixed atop the robot, so think of everything you can get done on an Android tablet and then add in mobility and some extra bells and whistles. If necessary you can remote control Furo-i using a smartphone app or voice commands, and get the droid to manage everything from your family's daily schedule to the security devices set up at your home. It's actually on sale now in selected markets (and has been since last year), though you need to contact the makers directly for a price quote. Sometimes the line between a home robot and a smart speaker is a blurred and indistinct one - devices like the Amazon Echo and Google Home do pretty much the same job as the droids we've already mentioned, but without some of the cute mannerisms and while stuck in one place in your home. The rumour is that Apple has something in the works too. You can get these smart hubs to control your lights, search the web, read out your emails, order pizzas, make calls and more. Of course they can't do anything that requires a screen - like show photos or stream video - but if you find a wandering humanoid robot a little creepy then these are the next best thing (and they're not as expensive either).